Home lounging is never complete without a nice pair of lounge pajama pants and as much as some men may like pajama sets more, just the pants with a plain T shirt looks a lot more cool and attractive to most women’s eyes I believe. So, here we have selected the best lounge pajama pants for men of different ages which make a great gift to offer and surely be highly appreciated, so go ahead and pick up one or two that you most like and indulge into some endless lounging with your partner. The Hanes Men’s Solid Knit Pant makes a perfect gift for the holiday season. It is made of 60% Cotton and 40% Polyester and is available in black, blue and heather gray. It has a drawstring waistband, single button fly and side pockets. It is ideal for lounging around and comfortable to sleep in. These pants feel very soft on your skin and lightweight. The drawstring makes them also very comfortable to wear. Some people had problem with the size so you must check the size chart before ordering it. Tag free labeling is another good feature in this product. 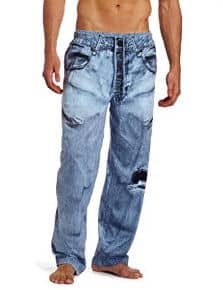 The MJC International Men’s Denim Pajama Pant has a modern looking design and gives the looks of jeans. It is only available in blue and made of 100% cotton. It has an open fly and an elastic waistband with a drawstring cord. It does not have pockets but it is designed to give a pocket like look. The open fly makes it necessary to wear an underwear if you are going out in it or have guests in the house. 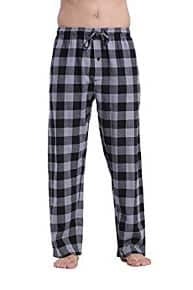 Most of the users say that these pajama pants are comfortable and look nice. 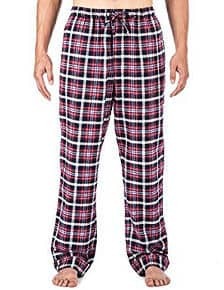 The CYZ Men’s 100% Cotton Pajama Pants are made of 100% cotton flannel which will keep you warm and cozy during those winter nights and they are good for casual wear around the house. They also feel very soft and light against the skin.The Elastic waistband ensures a nice and snug fit. A button fly provides for an easy access and each side has one pocket which is perfect for your hands to fit in. There are lots of designs and colors available to suit everyone´s taste. The Hanes Men’s Knit Pant is made of 60% Cotton, 40% Polyester and can be machine washed. It is available in four colors and has a contrasting black waistband with the Hanes logo on it. The waistband is elastic for some nice comfort. Users have not had any shrinkage problems even after a lot of washes. However, I did come across comments saying that they tend to be a bit large, so it is best not to go for a bigger size. You may find that you will have to get the length adjusted depending on your height. People also say that they fit very well and look great. 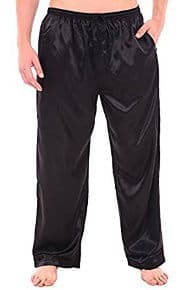 The Del Rossa Men’s Satin Pajama Pants are made of 100% polyester satin fabric which feels very soft against the skin. They are good for everyday use and to sleep in. The elastic waist with drawstring will provide you some good comfort. They also have two side pockets. There are plenty of colors and designs available like stripes etc. I was not so impressed with the designs but plain colors look nice. In addition, they are machine washable but you must see the washing instructions and wash them in cool water only. The company accepts returns if you are not satisfied with the product. The Calvin Klein Men’s Pajama Pant is not a low price product but the quality speaks for itself. It has many satisfied users and attracts a lot of repeat orders. It is made of 90% modal, 10% lycraelastane, and is machine washable. Only available in three colors, black, blue and mink. It feels very comfortable to wear and lounge around and looks stylish and trendy. Also features the Calvin Klein logoed elastic waistband. You would love the ultra soft feeling of the fabric when you wear it. 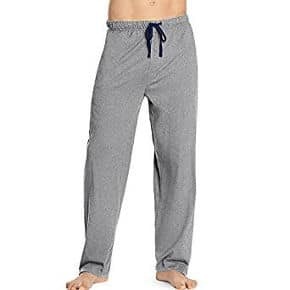 The Hanes Men’s Jersey Cotton Lounge Pants are made of 100% cotton except for gray which is cotton and polyester. They are made of jersey cotton which feels great against the skin and have a ¨comfort soft¨ waistband for added softness. They also have an easy button fly and side-seam pockets as well as a drawcord to adjust to the required size. These pants are perfect for lounging around or going out for some quick shopping and will make a wonderful gift for the holiday season or any other occasion. 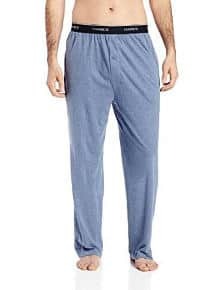 The Noble Mount Men´s 100% Cotton Flannel Lounge Pants are made of 100% cotton flannel which has the right feel for lounging or sleeping and there is a large choice of designs and colors to choose from. The soft yarn dyed flannel will provide some good warmth during the wintery days and nights. These pants also feature an elastic waistband with drawstring for comfort, a fly-front and two side seam pockets. The overall feedback from the users is excellent and they state that the price is very good for the quality and feel of these pants. The Utopia Wear Men’s Jersey Lounge Pants come in a 60/40 Cotton/Polyester Blend. They are good for casual wear at home as well as going to the gym. They have two side pockets and the ribbed waistband and drawstring closure allows for an easy wear. They are also machine washable. Regarding user reviews, there are some mixed comments with some people saying that the pants are quite heavy weight and others saying that they are very thin. However, they get a lot of above average reviews and the price is not so bad to try them out. 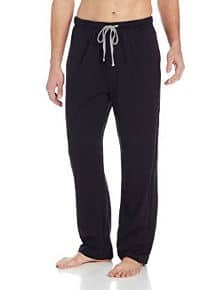 The CYZ Men’s Knit Pajama Pants are made of 100% cotton and come in black and blue only. They are perfect to lounge around and will keep you warm during the cool nights. An elastic waistband ensures a nice and snug fit and the button fly provides an easy access. Each side has one pocket (neither too deep not too shallow) which is perfect for your hands to fit in. Users give this product well above average ratings and say that it is made of a very smooth and lightweight cotton. Some of them have placed repeat orders. 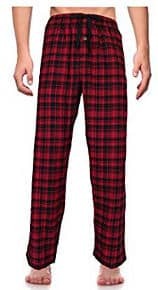 The RK Classical Sleepwear Men’s 100% Cotton Flannel Pajama Pants are made of100% cotton and come in different colors to choose from.Just keep in mind that they come in long leg. They have a comfortable covered elastic waistband with an adjustable drawstring and a single-button fly as well as two side hand pockets. They are also quite roomy so they will give you some comfortable space to relax and not be stuck on your legs. 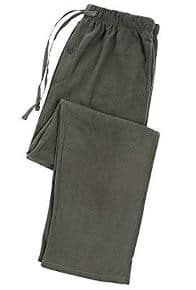 The North 15 Men’s Super Soft Polar Fleece Lounge Pants are made of soft and warm fleece material which should provide you with the much needed heat during cold days and nights. They also have a drawstring and an elastic band. The front button fly is provided for your comfort and convenience. Some of the colors and designs looks very trendy and modern and there are plenty of choices available. The reviews for these pants are fantastic and people have bought 2/3 pairs at a time and love this product. 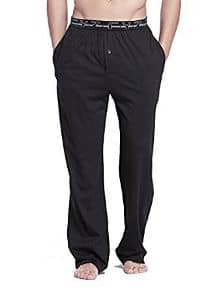 The CYZ Men’s Pajama Lounge Pants are made from 100% cotton knit for maximum breathability and comfort.They feature a button fly that gives you easy access and each side has one pocket. These pajama bottoms are soft, lightweight and extremely comfortable, making them great to sleep in, and they are also great as casual loungewear when you want to relax. At the time of writing this review, the company is offering 25% discount if you purchase two or more products. I should imagine they will continue this offer. The discount makes it a real bargain. 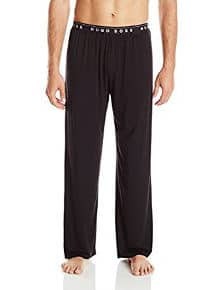 The HUGO BOSS Men’s Lounge Pant is made from modal blend fabric and is machine washable.It is available only in solid colors with a Hugo Boss label on the waistband. This is not a low price pant but I guess we should not expect that from a brand like Boss. Its quality is excellent. 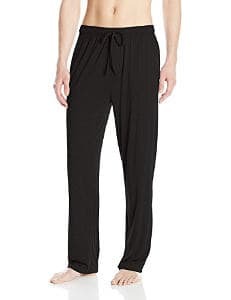 This looks very elegant even as a pajama pant and the fabric is extremely lightweight and soft. It does not have a fly so it is pull on and off job and there are no pockets either. 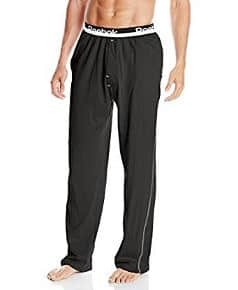 The 32Degrees Men’s Knit Lounge Pant is made of 92% Polyester and 8% Spandex. It is machine washable and, according to the users, it comes out like new after wash. It should also be noted that it is anti static and quick dry. It does tend to run slightly long so unless you are a very tall guy, be prepared to have them taken up a bit. In addition, it is available in solid colors only and comes with a pocket on each side. The feel is very soft and comfortable. It probably won´t be so warm in winter days but it´s ideal for lounging. 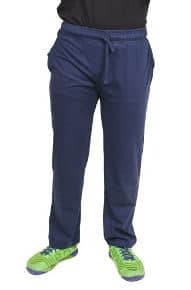 The Reebok Men’s Jersey Knit Lounge Pant is 100% cotton and appears to be available only in one color. I like the trimming on the waistband with the Reebok logo.It also has a dual pocket on the hip and a snap front fly closure. With a brand name like Reebok, I didn´t expect this to be a low price product but the quality makes the price worth considering. Sometimes, it is a lot safer to go for a slightly higher price and get a good quality product. The reviews are somewhat mixed but the overall conclusion is that the majority of users really like this product. However, a handful of people did have some problems. 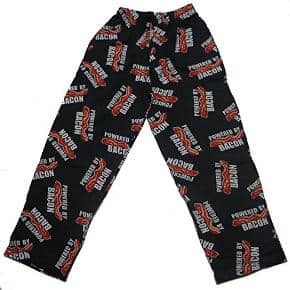 This Powered by Bacon with Bacon Strips Men´s Lounge pant is certainly a different but stylish looking lounge pant. It is made of 100% knit cotton and will make a great practical and playful gift. It is machine washable with button fly, side pockets and a covered elastic waistband with a concealed drawstring. It is suitable for both men and women. Some users had a problem with the sizes and said that the pants turned out to be somewhat small. However, the company offers a full money back guarantee if you are not satisfied. All in all, picking up some great lounge pajama pants for men makes a great loungewear gift for some endless lounging at home and this best products´ review has many different choices for you to easily choose from.